My schedule has been a bit crazy these past few weeks as things have been ramping up at work as we plan for 2017. Not to mention I recently moved to a new apartment in Jersey City and although I’m pretty much settled with all of the main furniture, there’s still a lot of decorating left to do. October was a pretty eventful month to say the least. And it’s all very exciting thankfully! With that being said, I’ve been paying a little less attention to putting makeup on my face lately and have been keeping things super simple during the week. I typically leave the weekends for experimenting with makeup looks and having some fun playing around with my stash, but I can’t say there’s been much of that going on either. My time has been consumed with shopping at IKEA, HomeGoods, Target and West Elm. And hey, I don’t mind that at all. If you keep things fairly simple for work or school during the week, these eight products will last throughout the day and get the job done just fine in my opinion! 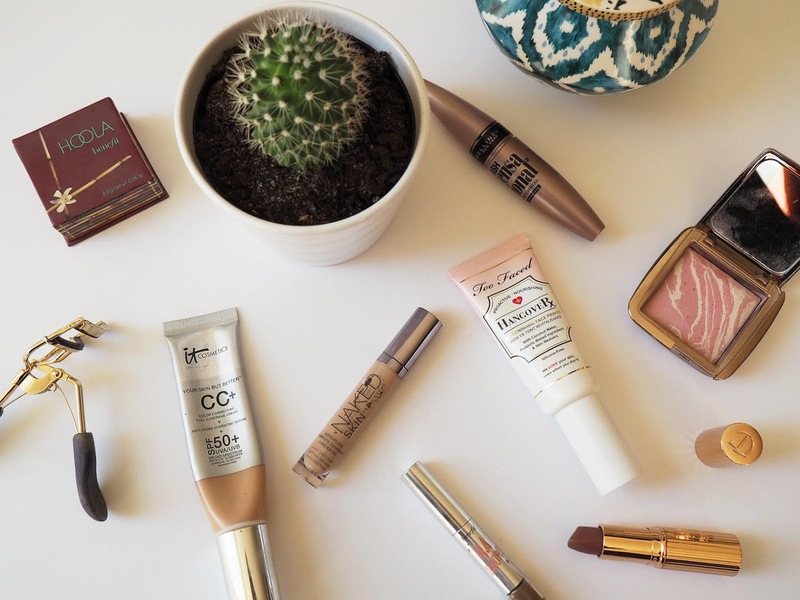 Some of you may think that eight products are way too many for a simple weekday makeup look and I realize that you are probably right. What can I say? I did try my best to narrow it down 😉 However, I definitely am in the market for a one stop shop palette, so please feel free to throw any recommendations my way! This one is new to my collection as I’ve been on the hunt for the right primer for my skin type. This primer is definitely loved among beauty bloggers and is recommended for dehydrated combination skin (my skin type). It’s infused with coconut water and a probiotic based ingredient, which work together to give you a radiant, dewy base. I’ve been using this concealer for the past few months and don’t plan on switching things up anytime soon. Before this, I was hooked on NARS Creamy Radiant Concealer, which is also great. I just find this one creases less, which makes it the winner in my book. Benefit Hoola gives the perfect natural looking tan that flatters any skin tone. I use it all year around and find that it looks just as good on my skin in the winter as it does in the summer. This blush gives a subtle, soft color to the skin, which I actually prefer on an everyday basis. This one is a cool-toned pink that shows up well on fair skin types, but I like it on myself and I’m a bit darker than fair. It gives me a healthy flush on the cheeks and that’s all I really need. I currently have a sample of this product and have been really enjoying using it. It seems that some areas of my brows have become rather sparse, so I’ve been relying on this highly pigmented gel cream to shape, fill and define my brows. Leave it to my favorite drugstore mascara to thicken, curl and define my lashes unlike most high-end mascaras I’ve tried. This one is the best, I promise. Ah, Charlotte Tilbury lipsticks. I’d been eyeing this one down for the longest and finally took the plunge. I wore this one to a wedding recently and it’s the perfect shade for the occasion as well as an ‘everyday shade’. Very Victoria is a soft medium rosy brown with neutral undertones and a semi-matte finish.